The seasons change and most people focus on putting away their winter clothes and bring out their summer clothes, but I start to focus on my summer eating. Burgers, of course, top out the list. Strawberry milkshake made with Dryer's ice cream. I'm a sucker for anything with avocado. This is the first I've seen it on a hot dog. The California hot dog is topped super, crisp bacon and slathered with a thick layer of guacamole. A little hard to eat, but I just had to appreciate how they sliced the hot dog in half for more surface area crispiness. And yes, the bun is grilled and toasted too. There are a good number of burgers to choose from, but you can't go wrong with a simple cheeseburger. A nice fluffy bun that soaks up all the juices in their medium rare cheeseburger. A solid cheeseburger, overall. I think I like this one better than my burger feeding at TrueBurger (see post HERE). Best thing eaten in this meal were the fries. 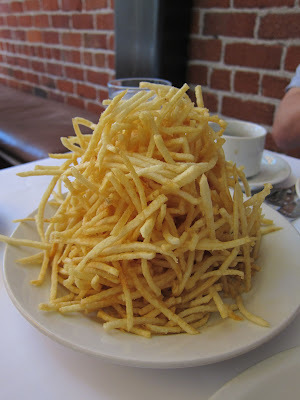 Somewhere in between McDonalds and In-N-Out, these handcut fries had super crispy pieces and some of those soggy pieces that I love in McDonalds fries. Flour + Co. is a newly opened bakery whose space feel light and airy, a perfect area for some springtime snacking. All the items are freshly made and bonus points for serving Stumptown coffee! All the item are a little on the smaller side, but that just makes for more room to taste more things. I had come here hoping to taste the peanut butter and jelly sandwich, but they didn't have it today. At least, they had the pretzel sandwich. The pretzel sandwich was so creative, but I like my pretzel a little more dough and the skin a little more chewy or even toasted. Somehow this one fell somewhere in the middle of all that. There is not much bready insides to this pretzel. Made with cheese, bacon, and tiny dots of marmalade. It gave an unexpected combo of sweet, salty, and savory. With two savory and one sweet housemade poptarts, the one that screamed eat me was the nutella, banana, and nuts. Nutella being the key ingredient to sway me over. As with all things nutella, you can never go wrong. Rich with little bits of banana flavor to cut through the chocolate hazelnut flavor, I only wished the pastry was a little flakier. The $5 toast and coffee combo has a choice between cinnamon swirl bread or wheat bread with jam or peanut butter. With a toast resurgence happening all over the city, I was a little disappointed with this cinnamon toast. I wished it was a thicker slice instead of the machine cut standard sliced bread. Also the cinnamon toast didn't have much cinnamon flavor and tasted a bit dry. The berry jam, however, was delicious and reminded of the fruity, housemade jam at Outerlands (see post HERE). 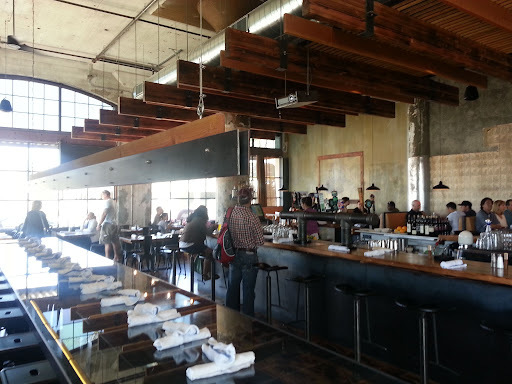 I'm all about Oakland food movement, especially reviving the Uptown and Jack London Square area so I really wanted to love this place. The space is amazing. 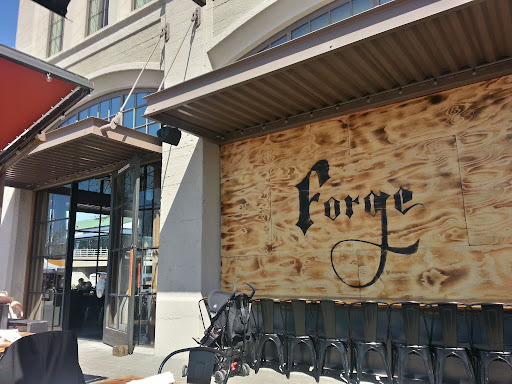 Right on the waterfront in Jack London Sqaure, its the perfect outdoor area on a sunny day in Oakland. Firepits in the outside seating area are lighted so you can even enjoy the chilly nights outside. 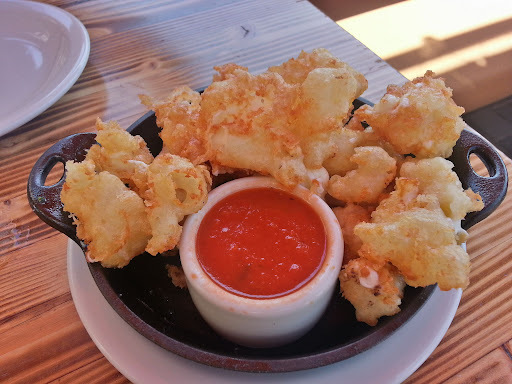 Fried crispy cheese curds. Little Miss Muffet couldn't have had it any better. These globs of cheesy goodness deep fried in a light tempura batter were just amazingly delicious. The single best thing of this meal. Though, the side of marinara sauce was a little bland. I wish it had a bit of spiciness to it, but it served its purpose. The margharita pizza came with your usual toppings: mozzarella, basil, and tomato sauce. The pizza was limp and soggy. The ingredients along with the pizza tasted like one giant mush. The burger, albeit very juicy, wasn't that great. It lacked much taste and heartiness. The fried potato puffs on the other head took second place for best side dish of this meal. Puffs of crisp potato with a pillowy soft center. It reminded me of Gregiore's potato puffs, but better! (see post HERE). Spanish music blasting and every table is filled with Spanish only speaking people, which I hoped was a good sign of some tasty food to come. The shaded outside patio was a nice spot to enjoy Mexican food on a seemingly summer day. From right; clockwise: carnitas, carne asada, al pastor, al pastor. While its kind of a no brainer to order something with seafood when the sign of the restaurant says mariscos (seafood), the al pastor seems pretty popular as well. 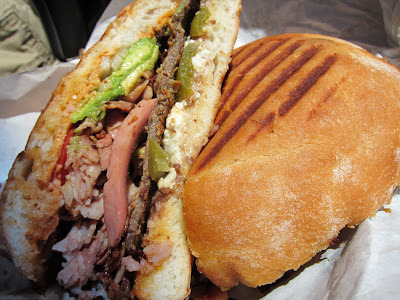 I still tried to round up the usual items: carne asada and carnitas just to cover the bases. The carnitas was a little too tender for my taste. 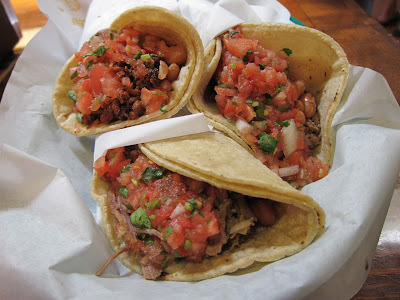 No crunchy or burnt bits that make carnitas so tasty. Same for the carne asada. Too cooked as if the meat had never seen a grill. Also, a tad on the salty side. The al pastor was probably the best of the bunch. Saucy with some flavor. Not good enough to order again though. Demison lies in a small unassuming strip mall in San Jose. This small store sells a lot of knick knacks and items that I recognized from my recent trip to the Philippines. You almost have to adjust your eyes to sort through everything in order to focus on the food at the counter. Right next to the register is a tin pan of homemade turon and some siopao. With the store reminding me of an episode of Hoarders, I did have my doubts of how good a tray of turon aka banana lumpia would be. Turon is a sweet Filipino snack made up of sliced bananas, sugar, and sometimes a piece of jackfruit. All other turon I've had look like fried, stumpy envelopes, so this is the first I've seen as a long, thin eggroll. Also, only banana in this one. Surprisingly in the middle of the afternoon, the turon was hot and seemed like it was freshly cooked. 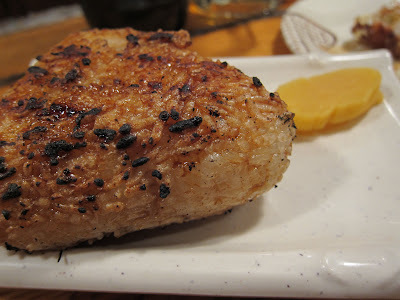 Not too oily and very crunchy. I think I'm a fan of this style of turon. Each bite has just the right amount of banana to crispy wrapper. 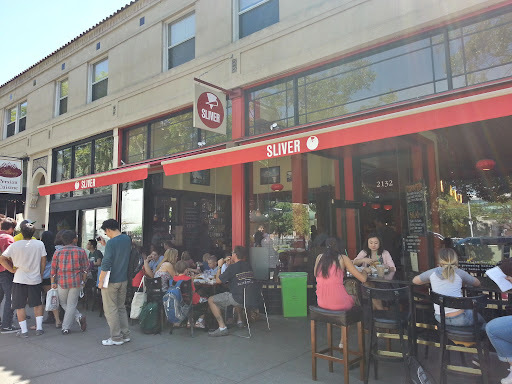 From the one type of pizza that differs every day to the live music, even down to the "slivers" of pizza given with every order, Sliver echos Cheeseboard (see post HERE) almost entirely in downtown Berkeley. The only thing that differs is the full bar and the legit seating area. 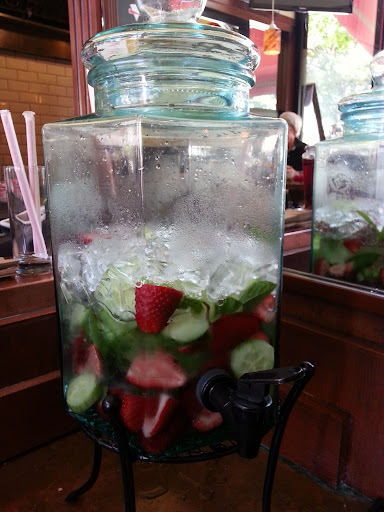 Cucumber, mint and strawberry flavored water is sweet, refreshing, and delicious. Funky beverages like mojitos served in coconuts and beers on tap are also thirst quenching options. With a similar pizza concept to Cheeseboard, fresh, seasonal ingredients changed daily, its hard not to love this pizza. Even the straw trays were similar to that of Cheeseboard's. Today's pizza was roma tomatoes, mozzarella, asiago, red onions, and cilantro. Tomatoes were super fresh and tasted like they were just plucked from the garden. The mozzarella gave the pizza a gooey, stringiness. Yum! The crust did taste slightly different than Cheeseboard's, maybe even more flavorful with a crispier crust. 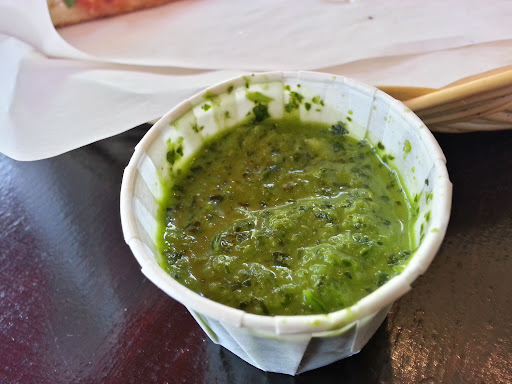 A dish of green sauce is optional to eat with you pizza. Although the cilantro sauce is delicious, I think it detracts from the freshness of the ingredients of the pizza. Empanadas seem to be one of the "in" food items this year. 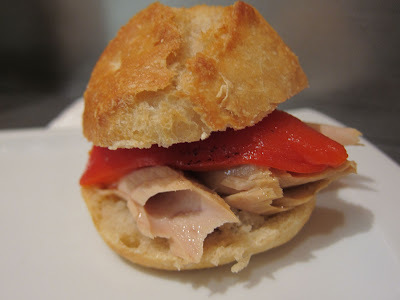 Not exactly an expert, but I've put away a good amount of them recently to make a legitimate comparison - Lolinda (see post HERE), Venga (see post HERE), El Porteno Empanadas (see post HERE). Venga and El Porteno were both disappointing, but Lolinda's corn empanadas are the best of the bunch until now. The combo gives you a choice of two empanadas and a side salad, but the salad is nothing special and I suggest skipping it and heading straight for the empanadas. 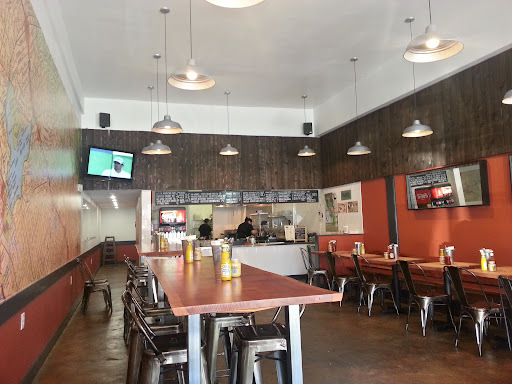 El Sur has a variety of empanadas: Traditional, pollo saltado, parisien, verde, and championes. The traditional (beef) and pollo saltado (chicken) were wrapped in the common half moon shape. The champinones (mushroom) and parisien (ham) were wrapped in a bun shape. The wrapper was perfectly flaky with just the right about of butter. The traditional is made with hand cut beef, onions, pimenton, hard boiled egg, olive, and oregano. Although the beef was tender and juicy, I didn't find this empanada that exciting. The championes (mushroom) was one of two of my favorites during this meal. The Parisien (right) was the other. Usually I stay away from ham because it tends to be overly salty in most cases, but the chopped prosciutto and country ham just oozed flavor. 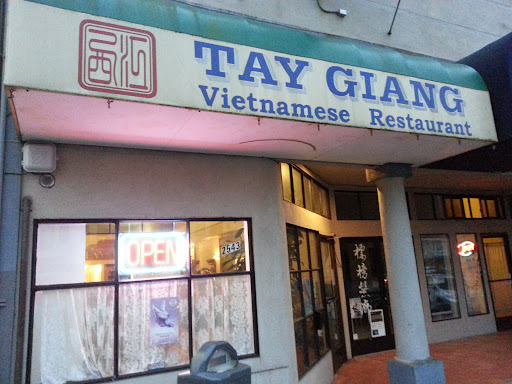 Tay Giang is one of those restaurants you may never think twice about going in if you walk by, but it hids a hidden secret - the fried catfish! Though the service may not be the greatest (the wait for your dish can be really bad), but its so worth it. This is the first time I've ever had catfish prepared this way. Everything about this dish is so perfect. The catfish is deep fried and drizzled with a sticky, sweet, garlic sauce. It comes in 3 sizes ($35/$40/$45), but even the smallest size is pretty filling. 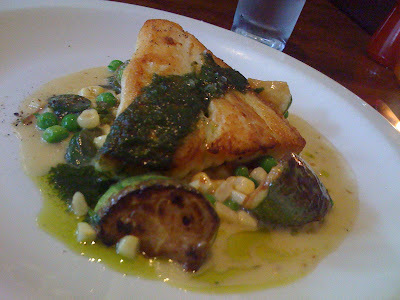 This dish is so perfect that even the way the fish is cut, you don't have to timidly look for pieces without the bone. 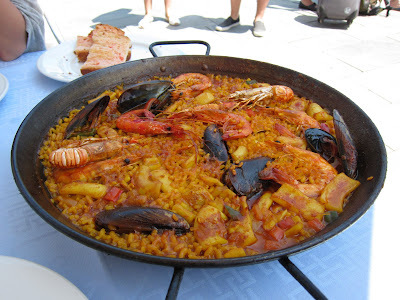 Its fileted so that the bones are on the bottom so you can enjoy the fish without worrying about choking on bones. Each piece is super crispy and fleshy. It compliments the fresh ingredients of the roll so well. Each piece is to be eaten wrapped up as a spring roll. The rice paper here is quality stuff. No rips or tears when rolling, even by a terrible roller like myself. 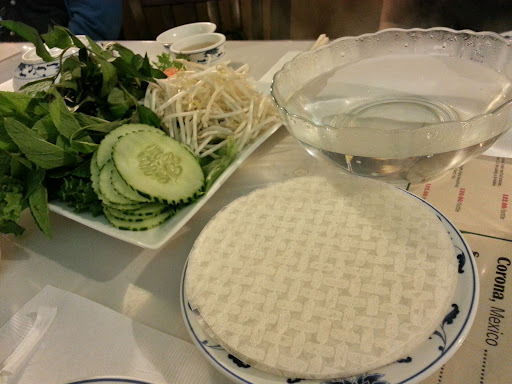 Veggies included were basil leaves, mint leaves, cucumbers, carrots, bean sprouts, and lettuce. For some reason, the vegetable plate only had 3 lettuce leaves. 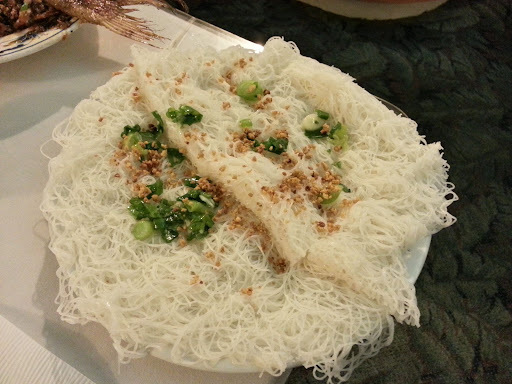 Banh hoi (thin vermicelli sheets) are included with your wrapping kit. It gives the roll a nice spongy, springy texture. The dipping sauce is a little sweet with a tiny hint of garlic. The bo tai chanh (raw beef salad) is huge. The serving size is best for 4 or more people. The layering of the meat did lend to some eating challenges. A pile of garlic, onions, and cilantro heaped onto the raw meat made it a bit difficult to pull the pieces in a delicate manner. It ended up just looking like a big delicious mess. The slices of meat are a little thicker than I like and I wish it had a little more lime flavor. Thin pizza is literally everywhere in the Bay Area, but I never get tired of trying out all the new ones. 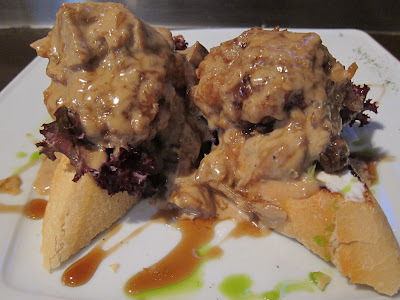 Del Popolo is another truck I've been trying to track down for a while. You have to really keep an eye on their website for their weekly locations. 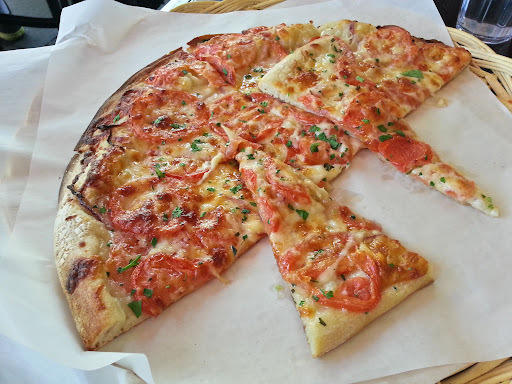 To date (in the Bay Area, there are two pizza trucks roaming around - Del Popolo and Caseys' (see post HERE). Casey's was not bad, but the pizza at Del Popolo deserves all of its awe inspired praises. This isn't your ordinary food truck. Not only is the pizza absolutely fantastic, the design of the truck is ultra cool. Their glass window on the side of the truck allow you to peer into the pizza making operation. This ricotta, olive oil, mozzerella, arugula, and rapini pizza is probably as close to a white pizza as I've seen on a artisinal thin pizza. You need to make sure each bite has a little bit of each ingredient so you can get the whole flavor of the pizza. Pretty amazing stuff going on here. 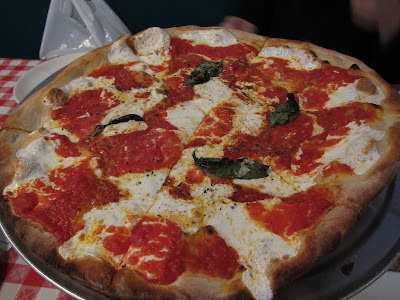 The standard classic of all pizzas in my book - the pizza margherita. The foundation of all pizza is the crust. This one hit all the right notes - charred, bubbly crust, the right amount of chewiness to the crust, globs of mozzerella, and the right amount of sweetness to tanginess in the tomato sauce. Definitely on the top five best thin crust pizzas in the Bay Area. Hard to believe a pizza this good came out of a truck. 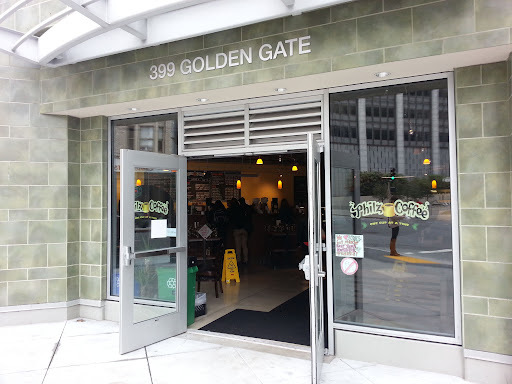 Philz Coffee seems to be popping up all over the Bay Area almost as if its trying to be the next Peet's. The coffee here isn't your ordinary Starbucks coffee. I love my coffee black, simple with nothing fussy about it, but Philz coffee's famous mint mojito iced coffee was a little too hard resist. Made like a mojito, mint is muddled with a pour over coffee along with milk and sugar. Crazy delicious with just the perfect amount of mintyness. It made a black coffee drinker, like myself, give a nod of approval. Ah, the kouign amann. 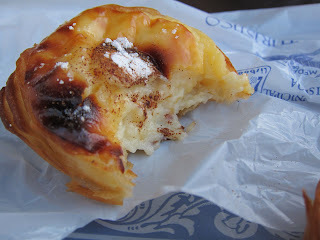 One of my top five favorite pastries, ever since my first bite at Four Barrel (see post HERE). The layered buttery, sugary, flaky pastry has just the perfect crisp top. The only thing better than one kouign amann is two kouign amann. The other one being chocolate. 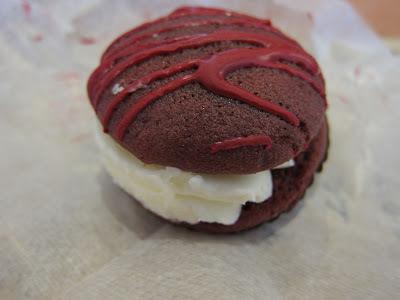 Just as good as the regular, but with chocolate oozing from the center. Zen Yai Thai isn't on the prettiest or safest block in town, but it does serve up some pretty excellent Thai food. 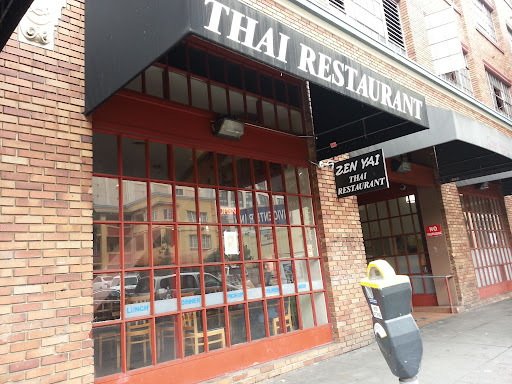 It's probably one of the few Thai restaurants I've seen in the city where over half the patrons are Thai. Most of the menu serves up pretty standard dishes, but the good stuff, as most serious eaters know, is list on the board. This one is extra special because it's only written in Thai! It lists out 3 soups: tom yum, boat noodles, and zen yai. A small bowl of each costs around $3 and are the perfect size to taste all 3 soups. 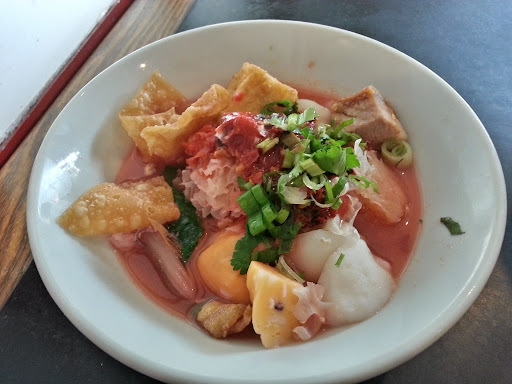 This is the first time I've eaten yen tafo (aka pink seafood noodles) or even seen it on a menu. The color of this soup reminds me of sweet and sour sauce, but the taste is far from. Thai dishes always seem to balance out the sweet, spicy, sour, and salty. This soup is a good example of that. It's a dabble of all four tastes along with fish balls, pork, flat white noodles, and a Chinese fungus, that I've only seen in Chinese desserts. Tom yum here is different than other tom yum soups I've had. The tom yum broth is clear and fresh tasting. No oily, heavy taste here. Each spoonful is light, fragrant, and soothing. With a choice of noodles, the white wide noodles are the most popular and obvious choice to compliment these Thai soups. The bowl is topped with slices of pork, bean sprouts, fried garlic, ground pork, and cilantro. The small boat noodles costs $2.50 a bowl and gives you just enough taste to realize how amazing it is. A choice of pork or beef ( this one is pork), this murky, rusty blood color soup is so much better than the one I had in LA (see post HERE). So much depth and flavor in one bowl. Best bowl of noodles I've eaten this year for me so far. People rave about the pumpkin curry here, but I didn't find it particularly special. Also, I asked for it spicy, which prompted the server to look at me and laugh. It didn't come out spicy at all. There is more chicken and shrimp than pumpkin (2 pieces! ), which wouldn't be bad if I hadn't ordered and expected a pumpkin curry.